The legume tree Pongamia pinnata (also called Millettia pinnata) is gaining importance as a biofuel feedstock tree because of the abundant annual production of oil-rich seeds, adaptation to a wide range of geoclimatic conditions and significant resistance to abiotic stress, such as water-deficit, salinity and acidity of soils. The major defining benefit of using pongamia as a biofuel feedstock is that it is a legume, enabling biological nitrogen fixation through symbiosis with soil bacteria, collectively called rhizobia, which results in root nodulation. Ø And no direct competition with existing farmland as it can be grown on degraded and marginal land. Ø As a legume it is also able to fix its own nitrogen from the soil, minimizing the need for added fertilizers. Whilst there are marked advantages in the use of Pongamia for biodiesel, many considerations are needed in addressing the world’s complex energy situation. The Centre for Jatropha Promotion & Biodiesel (CJP) has developed a highly productive variety of the plant and a set of best practices that will enable high oil yields. CJP’s research team has identified and collected 42 high-yielding pongamia candidates and evaluated genetic association and variability in seed and growth characteristics in order to develop improved varieties. The CJP team’s pongamia work is currently focused on genomic and genetic research. This work will enable highly productive plantations of the crop to be grown. CJP researchers have overcome several challenges that will help enable commercial cultivation on pongamia. “The first challenge was to get the required yield, to get the plant to grow and understand its productivity over a number of years, and another problem was its maturity, which is about seven years,” he said, noting that the CJP’s D103SAP variety has overcome these programs. Maharshi also points out that the CJP’s proprietary variety flowers three years sooner than standard varieties. While pongamia traditionally flowers in its seventh year, D103SAP flower in the fourth. To take it to a step forward to ensure better uniformity, improved self-branching, early flowering and higher productivity, CJP’s further work with pongamia, focused on further understanding the unique properties of the plant that can be manipulated to coax it to reach its fullest potential and the extensive research resulted in mass propagation technology. CJP's proprietary technology for the mass production of Pongamia Pinnata plants from mini-cuttings obtained from the mother plant raised throughDI03SAP ™seed enables a significant production increase over traditional propagation methods. 1. -quickly scales large Pongamia Pinnata projects with consistent, high yielding Pongamia Pinnata. 2. -Facilitates production of the large volumes of low-cost crude Pongamia Pinnata oil required by major energy, oil and transportation consumers. 3. -Requires 1/75ththe land needed to produce cloned plants by micro propagation, with the added benefits of HYV vigor, strong roots and overall improved plant health. The surface required to grow sufficient feedstock for today’s biobased fuel production is less than 0.008% of the global agricultural area of 5 billion hectares. In a world of fast-growing population with an increasing demand for food and feed, the use of feedstock for non-food purposes is often debated controversially. The Study Report “Non Food Biodiesel – Enhanced Economics & better break-even” published by Biodiesel Business Academy (BBA) has given the debate a factual turn. In a world of fast-growing population with an increasing demand for food and feed, the use of feedstock for non-food purposes is often debated controversially. Dilemma of diverting crops and farmland that once produced food for family and for feed for animals, is now being produced for biofuels is not right and just to take the debate away and make it unnecessary we at CJP are promoting nonfood oil crops on the no use land- land that is not otherwise suitable for farming of foods. Many studies have shown there is enough land available to produce more food, more feed and more biofuels. Though the discussion of indirect land use change (ILUC) caused by biofuels is not scientifically supported, the Pongamia does not causes land use change. Contrary to it Pongamia is targeted for marginal lands which are unproductive, often because of salinity and for water logging. It is claimed to be highly salt tolerant and as such is used for reforestation in the dry, saline wasteland. Biodiesel can make a large contribution to the world’s future energy requirements; this is a resource we cannot ignore. The challenge is to harness it on an environmentally and economically manner and without compromising food security. Pongamia has attracted attention as pressure mounts to find sustainable alternative fuels to help meet countries' renewable energy targets and cut greenhouse gas emissions, without interfering with agricultural production. Researchers at CJP has honor to establish this untapped resource as alternative source for Bio- Diesel industry of future as pongamia is a strong candidate to contribute significant amounts of biofuel feedstock. 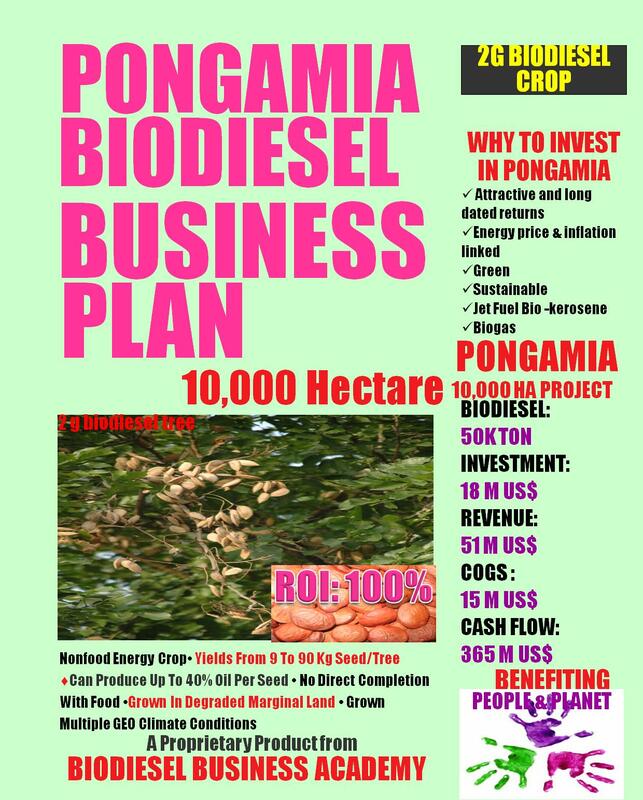 Therefore the Pongamia Pinnata trees must be regarded as a sure source of 2nd Generation Biodiesel and the foundation around which a profitable Business plan can be built for its ability to provide large amount of oil and its pure hardiness and stress handling ability. The Pongamia Pinnata is tree that has enough credentials: a higher recovery and quality of oil than other crops, no direct competition with food crops as it is a non-edible source of fuel, and no direct competition with existing farmland as it can be grown on degraded and marginal land. As a legume it is also able to fix its own nitrogen from the soil, minimizing the need for added fertilizers. A feasibility study and a business plan are essential steps in developing a successful biodiesel business. However it is not easy to prepare an excellent business plan. With its extensive experiences in the field, enhanced technology, plant science & professional knowledge, effective consulting service and business intelligence CJP can clearly understand the business model, products and services, production, marketing and provides all aspects of feasibility analysis and business development including assessments of the following: crop production, crushing, co-product markets, feedstock acquisition and contracting, technology analysis, risk analysis specific to biodiesel technology, feedstock, markets, and general project risks, market and financial analysis. We make the integration of our experience and professional knowledge with your information. We provide in depth analysis of crop cultivation and crop care part of plan for which we have team of agronomist and plant scientists, and then we have engineers and experts in biodiesel industries to finish the technology and production part of business plan. We have professionals in accounting to complete financial and economics part. CJP can offer the type of consulting that only numerous years of leadership in the biodiesel market can provide at an affordable price. CJP estimates the key financial figures for a company’s Pongamia Project over 11 years. Th3e projections include abbreviated income and cash flow statements and a balance sheet.